It's been a year since Xiaomi launched the Mi Max 2 which is the successor to the 2016's Xiaomi Mi Max. Now, many fans are eagerly waiting for the arrival of the Mi Max 3 and even though Xiaomi will be holding an event in Shenzhen later this month where it will announce its new products such as the Mi 7, Mi 8th Anniversary Edition and Mi Band 3, the Mi Max 3 might not be announced at the upcoming event. 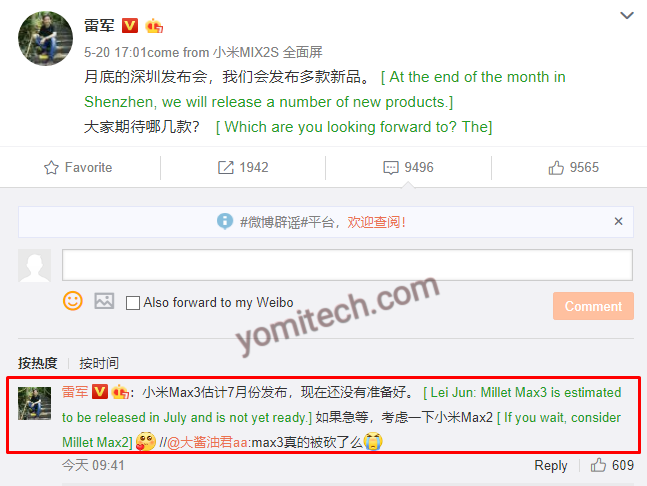 According to Xiaomi's CEO Lei Jun, he confirmed through Weibo that the Xiaomi Mi Max 3 is not yet ready for unveiling and won't be announced at the upcoming Shenzhen event. 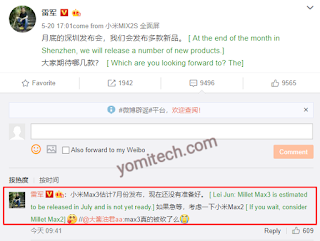 According to him, the Xiaomi Mi Max 3 won't be ready for its launching until sometime in July. Although there isn't any official information on the specs of the upcoming Mi Max 3, but going by rumoured and leaked specs, the phablet will be powered by Qualcomm's Midrange Snapdragon 636 chipset with 4GB RAM and 64GB of expandable internal storage. There might also be another version with a higher Snapdragon 660 chipset and a 128GB internal storage. The Mi Max 3 will most likely sport a 7-inch FHD+ display with a much more thinner bezel than its predecessor as well as a slightly larger 5500mAh battery. Lei Jun however advises those who can't wait for the Mi Max 3 which might take another 2 month to consider buying the current Mi Max 2.